Shortly after the official start of the 2008 financial meltdown, there was an exchange of emails between members of my section at the Harvard Business School, class of ’72. Frustrated and dismayed by what was occurring, I prophesized that our grandchildren would dig up our bones and smash them in anger at the economic sins we had committed and visited upon them. It being Sunday, one classmate suggested that I was merely “preaching.” Perhaps I was, but four-and-a-half years later I happened upon a sermon filled with fire and brimstone on a scale much greater than the one I proffered. It is time to open your eyes and arise from your stupor. Observe what is happening around you. Look closely. Does the storyline match what you see in your ever day reality? It is them versus us. Whether you call them the invisible government, ruling class, financial overlords, oligarchs, the powers that be, ruling elite, or owners; there are powerful wealthy men who call the shots in this global criminal enterprise. Their names are Dimon, Corzine, Blankfein, Murdoch, Buffett, Soros, Bernanke, Obama, Romney, Bloomberg, Fink, among others. They are using every means at their disposal to retain their control and power over the worldwide economic system and gorge themselves like hyenas upon the carcasses of a crippled and dying middle class. They have nothing but contempt and scorn for the peasants. They’re your owners and consider you as their slaves. They don’t care about you. They think the commoners are unworthy to be in their presence. Time is growing short for these psychopathic criminals. No amount of propaganda can cover up the physical, economic, social, and psychological descent afflicting our world. There’s a bad moon rising and trouble is on the way. The time for hard choices is coming. . .
S’pose David Stockman isn’t surprised. Hat Tip: Remus at Woodpile Report. 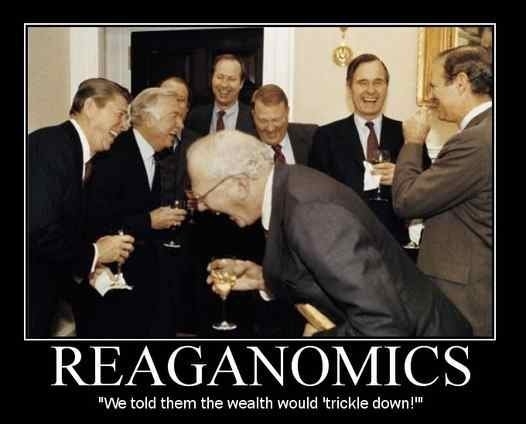 1 Response to Where’s the Trickle-Down? I fail to see that it’s in the interest of the oligarchs to destroy the world financial system that so benefits them. I’m afraid that rather than a conspiracy, we just have usual human short sightedness, greed, and bumbling. Nevertheless, in human history there have never been so many comfortably affluent people, and I’m including in that category the so-called poor in the USA. It would be hard to find anyone who would be willing to live the way my grandparents did at the turn of the twentieth century.